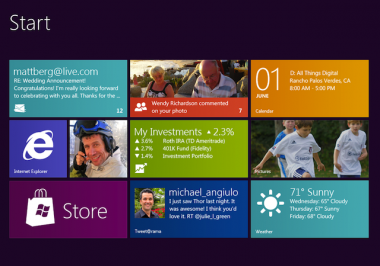 Microsoft said that upgrading to Windows 8 Pro will cost $39.99 (£25.59). This will get you the full professional version, which includes business-friendly tools such as remote desk top and file encryption. Anyone currently running XP, Vista or Windows 7 will qualify for the upgrade. And there’s more: Windows Media Center, removed from the OS as a default application, will be offered as a free add-on. Microsoft said it would release a tool to help users upgrade. Anyone on Windows 7 will be able to keep all files and personalized settings, but those on older operating systems may lose some settings.UK pricing wasn't available at the time of writing. A DVD version will also be available for $69.99 (£44.80). Have you only recently upgraded to Windows 7? Or held out on XP, terrified of negative reports about the horrors of Vista? Either way, you can upgrade to Windows 8 for the same p rice but if you're on XP, check first that your hardware can handle it. And, if you're a fan of Windows Media Center, Microsoft is handing that back to you for free. All in, that’s not a bad deal. This is good news from Microsoft, and should encourage people still using the 10-year-old XP to switch to a modern operating system. We think XP was one of the best versions of Windows, but it's beginning to show its age. Making it easy to upgrade should help boost sales of Windows 8, whose reputation is already suffering from mixed reviews based on preview releases. However, we're disappointed that Microsoft - like many other US companies - hasn't immediately issued a UK price. Don't forget your overseas fans, Microsoft.